Another great find by our friend Anna Lisa, Cavern is a boutique wallpaper design company with several pop art looking creations. This one happens to be a great way of having an instant wall library for your home office. Imagine this as a backdrop for your desk. Just remember that this will probably be your one and only big idea. Everything else in the room should be clean and subtle. A white room will make this wallpaper pop and if you pull one primary color from the design, you can have a bold accent color that will tie everything together. The wallpaper is $8/sf. Very reasonably priced. Learn more about the product and the design group at Cavern Home. It reminds me of building blocks – old school thinking results with new school design. Linda Ferrol in Washington has recreated these wood pen holders for your desktop. Reminiscent of her days spent in kindergarten, these units are relatively small (3 3/4″ square), yet provide a great visual impact. Use one block with pens and pencils in the same color or streamline the boldness with just one particular type of instrument. I think you’ll find these to be quite fun sitting on your desk and quite useful as well. Buy directly from the LF studio for $17. Thank you Anna Lisa for passing this one along. Don’t you hate plugging in your power adapters and various cables, pulling them up from below the desk only to find that the chords have made their way back on the ground ? Could the answer be this simple? As seen here, use extra large paperclips on the edge of your desk and pull your chords through so that the connectors rest within the handles. Such a brilliant idea with simple tools. Take advantage of it for your desk needs. Need some inspiration for your home office? From the pages of Elle Decor. I love it all. The chic Chinois black chairs, the painted black mullions of the window, the all white space, the stainless steel work surface – all of these elements make for a very posh home office that can be replicated in practically any room. Here’s what you might not realize, you can create this desk with old bedside tables that are repainted and used as the base for this linear workstation. Also, find cork tiles for a floor and install them on the entire wall and have an instant tack board for displaying pictures, art and important documents and calendar dates. Remember, stay consistent with your accessories. In this case, use the same type of thumb-tack and clip for the wall. And if you happen to have one, place your Emmy award on the side as a paper weight. 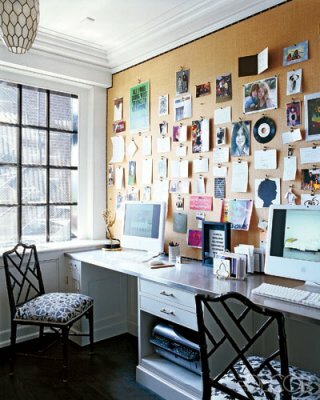 Be sure to check out Apartment Therapy’s Get The Look with this home office example. Bold graphic art flanks the computer; selective spurts of color; intriguing art wall installation; all placed within a white backdrop. Take a look and see how you too can get the look. It’s the basic ideas that turn into great fortune, right? Chad Doane understands this concept well. After noticing that half his colleagues were using grid paper for notes and the rest using traditional lined paper during a meeting, he streamlined the two to create Doane Paper. Practical and stylish, the entire collection is a great tool for organization and the perfect handsome set of stationery for your desk. I thought you would appreciate Doane’s simple and user-friendly site. His offering of the entire collection in one kit is a great way to update your accessories. Throw out that yellow legal pad and adopt the minimal look of this entire collection. The Daily Arsenal Kit comes equipped with three large and small writing pads, three Flap Jotter, three Utility black notebooks, one TL Series notebook, one small and large idea journals, three Sharpie fine point pens, and three zebra no. 2 pencils. All of this for $65.50, plus free shipping directly through Doane Paper’s shop site. Justin & Michelle Demers are photographers with their own studio/business in Toronto, Canada. Living in a small 700sf space, they have carved out a special place to call home. With a self-described mix of clean and comfort, their pad appears much larger; Perhaps its because of their use of simple clean furnishings, or their bold use of vibrant splashes of color. For example, their home office is in the mix of the main living space, marked by the turquoise wall and simple white worksurface. Take note of the clever artwork they have created. Using a series of vertical cable lines, they have posted many of their own family vacation c-prints. Such a simple concept, yet a bold impression. What makes this design work is the bold backdrop color, the random vertical lines created by the cables and photographs, plus the clean work desk (get rid of the clutter, especially if living in these tight spaces). Be sure to check out the entire set of home pics on Design*Sponge for the Demers great taste and design.